If there’s one thing that all Indian kids from the late 80’s and the early 90’s can most easily relate to, it is how technology has transformed their lives and even outpaced their own growing up with time. From the days of having no choice beyond Doordarshan to the days of the coloured cable TV and now fast-forwarding to a time when about everything is getting streamed online; or from having that one landline phone in the family (or sometimes in the neighbourhood) to seeing even the ‘average Joes’ own mobile phones equipped with video calls, technology is making product and service life cycles shorter by the day. Standing at the cusp of the ensuing large-scale next-generation advancement are technologies we often hear about, like the IoT, 3-D printing, artificial intelligence etc. All these and more together constitute an oft-heard term in today’s business circles, known by the name of ‘disruptive innovation’. 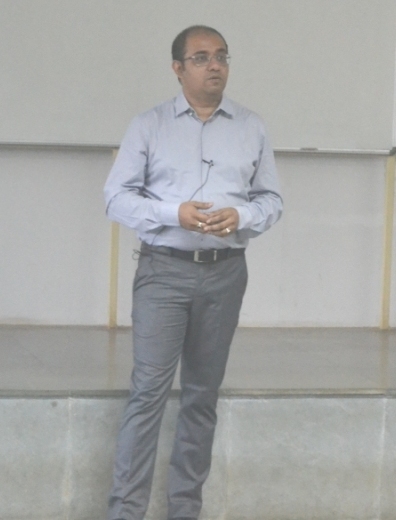 On the 31st of October, 2015, VGSoM IIT Kharagpur had the pleasure of welcoming Mr. Arijit Sen, Global Head Strategy & Market Intelligence (Sr VP), Swiss Singapore Overseas Ent – An ABG Company, to deliver a guest lecture on ‘forward looking business strategies in the current context of disruptive innovations’. Mr. Sen’s lecture was replete with examples of how a disruptive technology can not only affect it’s immediate predecessor but also other unrelated businesses. For instance, the growing shift towards online banking isn’t just a challenge for the traditional banks but also for the real estate industry that has over the years invested heavily on the idea of a tangible and lavish up-street presence of bank offices. With banks moving out of such offices, the real estate players need to find new takers for these luxuriant spaces or reinvent them as hotels, as has already been done by a handful of them. Supporting his ideas with other such examples from diverse fields, Mr. Sen zeroed in on the four prime disruptive factors in today’s business scenario: climate, currency, creativity and connectivity. With climate change continuing to be a pressing issue on a global scale, it’s paramount role in altering the costs of production for industry can be realized by the ever-increasing pressure on companies and Governments to work under stringent emission caps. This leaves businesses viewing climate change as a threat to their supply chain and ultimately their bottom line. Mr. Sen pointed out currency as a major disruptor and cited the example of Bitcoin to drive home the possibility of a cashless future and by extension a common global currency. Coming to creativity, he overwhelmed the crowd of students with the range of things that 3-D printing has done and could do, thereby rendering building and construction companies among other firms in a fix. Energy crowdsourcing, cloud technology and other such innovations make connectivity also a major disruptive factor that could change the face of communication and transport as we know it. To overcome these disruptive forces, Mr. Sen picked on a number of points that businesses need to look after but marked out ‘common sense’ as the one most important attribute that emerging business leaders should strive to have more of. Casting light on the need to adapt to the transforming nature of technology and lifestyle and also to the increasing job specificity in our workspaces, he recommended the students to develop a habit of watching out for coming trends and analyzing how these trends can affect all the stakeholders from all possible perspectives. An interactive style of lecture made the lecture all the more informative and Mr. Sen was pleased with the inquisitive questions that the students came up with. Mr. Sen made the students formulate strategies to certain problems themselves, thereby motivating them to think of ideas and backing those ideas up even if they hinge on being seemingly unreal. The session thus ended with the students gaining valuable knowledge on a topic that is very much intertwined with our present and our future.